What goes into a Japanese dish? Soy Sauce: Soy sauce is produced in most of the countries, but soy sauce prepared in Japan is the authentic form of the sauce. Variation is usually achieved by using different methods and durations of fermentation, different ratios of water, salt and fermented soy, different thickness or viscosity, or through the addition of other ingredients. Soy sauce is rich in lactic acid bacteria and has an excellent anti-allergic potential. Sake: (Japanese alcohol) is often used in Japanese cooking much like white wine is used in western cooking. It is made from fermented rice. Sake is served chilled, at room temperature, or heated, depending on the preference of the drinker, the quality of sake, and the season. The microorganisms present in the fermented drink offers some health benefits. Also, some studies claim they are helpful in preventing cancer, atherosclerosis and protect the liver. Mirin: Mirin is an essential condiment used in Japanese cuisine, consisting of around 40 -50% sugar. It is a kind of rice wine similar to Sake but with a lower alcohol content. It is used to sweeten dishes, reduce the smell of certain fish dishes and give vegetables and other food a shiny appearance. Kombu: It is a type of weed that is used in dishes along with cured skipjack tuna (a type of fish), sometimes referred to as bonito and niboshi (dried baby sardines) and is often used to make dashi stock. Yuzu is a citrus fruit and a frequent condiment, mashed up into a relish, sold as yuzukosho and is blended with pepper/chili and salt. Yuzukosho is eaten with many dishes, adding a flavorful kick to broth/soup items. Yuzu is also used to flavor teas, jams and jellies. 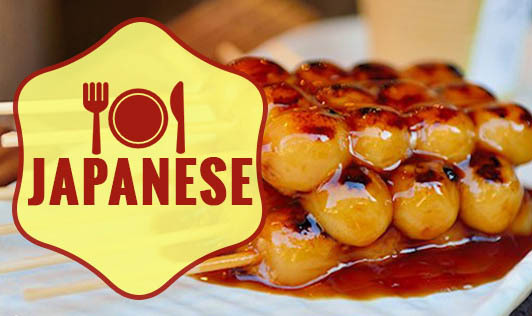 Japanese cuisine combines the staple food which is steamed white rice with one or several main dishes and side dishes. This may be accompanied by a clear or miso soup and some pickled products. Most of the food is served in small amounts. Since a soup always accompanies the meal; it could be a good appetizer that can control your calorie intake. Pickles once in a while may be a good choice, but they are generally saturated with salt. So, you may have to watch your intake. There are different kinds of non-vegetarian food that is eaten. Whale meat and turtle meat are some of them. Most of these dishes are eaten in small quantities, but an excess of rice may not be the right choice for those trying to cut down on carbohydrates. The alcohol content in sake varies with the way in which it is prepared. Depending on the type of sake, the alcohol content varies. Too much of it won't be recommended. Most of the side dishes are deep fried and so is high in calories and fat. Some of the sauces too are high in calories. A traditional Japanese meal may include a sweet and this again, may not be a healthy choice to make. Japanese food can be eaten occasionally; but on a regular basis, it could lead to an increase in carbohydrates, fat, and calorie. Having said that, it is important to understand that all cuisines have their own traditional way of preparing food. Some cuisines may be unhealthy while some may be healthy. It is up to you to pick the best of each cuisine and make use of them in the right way! Dishes made of Tuna and Suna are cooked in different forms in our cooking. You could try a few Japanese recipes with these fish. Cooking it with less oil or grilling the fish can be a healthy choice. If you are having a theme party at home, try going Japanese for a meal! It could be an adventurous and exciting party!